The Yosemite Valley is a popular tourist destination, hosting millions of visitors each year. The glacial valley framed by such awe-inspiring granite formations as El Capitan and Half Dome is known for its dramatic waterfalls, giant sequoia groves, and biological diversity. 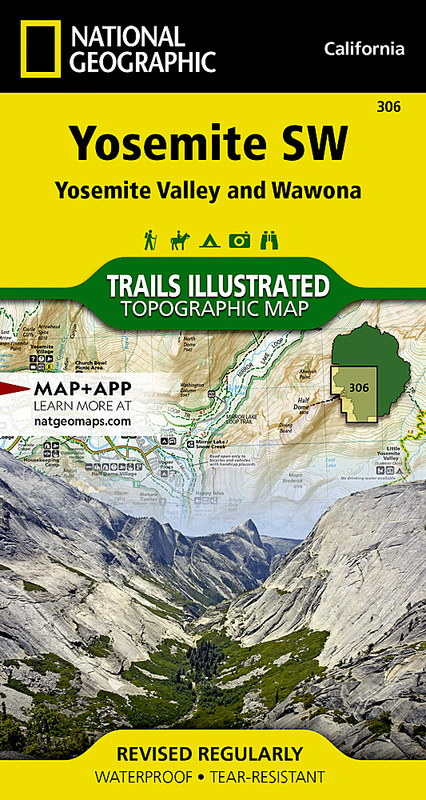 National Geographic's Trails Illustrated map of Yosemite SW: Yosemite Valley and Wawona delivers unmatched detail and valuable information to assist you in your exploration of this spectacular wilderness. Created in partnership with local land management agencies, this expertly researched map features key areas of interest including Yosemite Valley, Wawona, White Wolf, Merced and South Fork Merced rivers, and Sierra National Forest. Designed with a wide range of visitors in mind, this map features detailed and easy to read trails that include mileage between intersections, accurate road network, campgrounds, trailheads, lodging, restrooms, and food services. Sections of the Pacific Crest and John Muir trails are clearly marked. A variety of helpful information about wilderness hiking and camping, permits, bear safety, and survival tips is included as well. The map base includes contour lines and elevations for summits and many lakes. Other features found on this map include: Bridalveil Fall, Chowchilla Mountains, El Capitan, Illilouette Falls, Lower Yosemite Fall, Nevada Fall, Ribbon Fall, Sierra National Forest, Silver Strand Falls, Stanislaus National Forest, Upper Yosemite Falls, Vernal Fall, Yosemite National Park, Yosemite Valley.